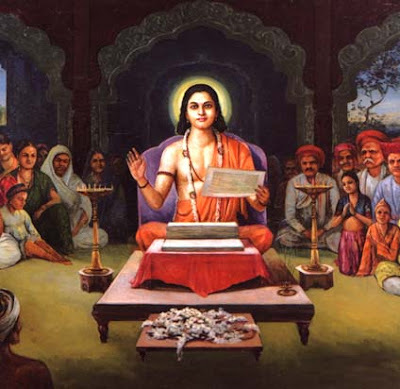 Jnaneshvar was a great Siddha, mystic and poetic genius of Maharashtra, India who died at the age of 21 in ecstasy. His spiritual roots were in both the Nath and Bhakti traditions and listed his lineage as Shiva, Shakti, Matsyendra, Gorakhnath, Gahini and Nivritti (his elder brother). At the age of fifteen (1290) he is said to have delivered ex tempore the nine-thousand verses of his poetic commentary on the Bhagavad Gita; Jnaneshvari (Jnaneshwari) or "Goddess of Wisdom" [ also called Bhava-Artha-Dipika ("Light on the meaning of Being")]. Jnaneshvar's teaching was non-dualist, saying that the mainifest world is a "sport" (vilasa) of the Absolute; the Love of the singular Reality, and regarded bhakti (devotion), the means to liberation. [The devotee] regards the Guru as a holy place, his deity, mother, and father, and knows no other path than service to him. It is the joy of his life to live in his Guru's house, and he loves others who serve the Guru as his own brothers. The repetition of the Guru's name is his only prayer, and his only scripture is his Guru's words. For him the water that touches his Guru 's feet embraces all the holy places in the three worlds. If he should find some of the leftovers of his Guru's meal, they would be a feast far more sumptuous for him than even the bliss of samadhi. O Arjuna, he would take a speck of the dust raised by his Guru's feet as the price with which to obtain eternal joy. What more can I say? His devotion is boundless. Out of overpowering inspiration, I have described it in this way. A person who has this kind of devotion and who enjoys nothing but serving the Guru is a treasure house of wisdom. Wisdom is even honored by his existence. He is a god and wisdom is his devotee. Wisdom enters him through open doors and lives in him. It is enough to satisfy the whole world. Jnanadeva says, My soul takes delight in serving my Guru. This is why I have explained it in such detail. Otherwise, if I am not occupied in serving him, I am helpless even though I have hands, I am blind to worship even though I have eyes, and I am less able than a lame man to walk around the temple. I am mute in praising his glory even though I have a voice, an idler who eats others' food. Yet in my heart I have the sincere desire to serve him. The "King of Saints" was Jnaneshwar (1271-1293), who, while living only twenty-two years, made an indelible mark on the whole of Hindu spirituality. Before Jnaneshwar's time, the scriptures of India were in the secret language of Sanskrit and completely unavailable to the lower classes. Breaking from tradition, Jnaneshwar not only translated the central Sanskrit text, the Bhagavad Cita, into the common language of Marathi but added a magnificent commentary which expounds the complete path of yoga and spiritual practice. His commentary, the Jnaneshwari, still stands among the greatest spiritual works ever written. It cannot be spoken of or spoken to; by no means may It be comprehended by the intellect. Salutations to the Lord of all, who is concealed with-in the visible universe. It is He who causes this universe to appear, and it is He who causes it to vanish as well. When He is revealed, the universe disappears; when He is concealed, the universe shines forth. Yet He doesn't hide Himself, nor does He reveal Himself; He is always present before us at every moment. No matter how diverse and varied the universe appears, He remains unmoved, unchanged. And this is just as one would expect, since He is always one, without a second. ... It's that one pure Consciousness who becomes everything-from the gods above to the earth below. Objects may be regarded as high or low, but the ocean of Consciousness, ever-pure, is all that ever is. Though the shadows on the wall are ever changing, the wall itself remains steady and unmoved. Likewise, the forms of the universe take shape from Consciousness-the eternal, primordial One. Sugar is only sugar, even though it may be made into many forms. Likewise, the ocean of Consciousness is always the same, though it becomes all the forms of the universe. Various articles of clothing are made from the same cotton cloth; likewise, the varied forms of the universe are creatively fashioned of the one Consciousness, which remains forever pure. Whatever form appears, appears because of Him. There is nothing else here but the Self. It is the gold itself which shines in the form of a necklace or a coin; they are made of nothing but gold. In the current of the river or in the waves of the sea, there is nothing but water. Similarly, in the universe, there is nothing which exists or is brought into existence other than the Self. Though it may be smelled, or touched, or seen, there is nothing else in camphor but camphor. Likewise, no matter how He experiences Himself, the Self is all that is. Whether appearing as the seen, or perceiving as the seer, nothing else exists besides the Self. Through Her, The absolute Void became the primal Person (Purusha); And She derived Her existence from Her Lord. Shiva formed His beloved Himself; And without Her presence, No Person exists. Because of Her form, God is seen in the world. Yet it was He Who created Her form of Himself. When He embraces Her, It is His own bliss that Shiva enjoys. He is the Enjoyer of everything, But there is no enjoyment without Her. She is His form, But Her beauty comes from Him. By their intermingling, They are together enjoying this feast. Shiva and Shakti are the same, Like air and its motion, Or gold and its lustre. Fragrance cannot be separated from musk, Nor heat from fire; Neither can Shakti be separated from Shiva. If night and day were to approach the Sun, Both would disappear. In the same way, the duality of Shiva and Shakti Vanishes, when their essential unity is seen. Since He appears because of Her, And She exists because of Her Lord, The two cannot be distinguished at all. When He awakes, the whole house disappears, And nothing is left. They became two for the purpose of diversity; And both are seeking each other For the purpose of becoming one. Each is an object to the other; And both are subjects to each other. Only when together do they enjoy happiness. The lover, out of boundless love, Has become the Beloved. Both are made of the same substance And share the same food. Out of love for each other, they merge; And again they separate for the pleasure of being two. When sleep comes to an end, a man returns to his senses. Now my individuality has come to an end, and I have returned to Shiva and Shakti. Salt gives up its salty taste to become one with the ocean; I give up my individual self to become Shiva and Shakti. When the covering is removed, the air inside a plantain tree merges with the air outside. And this is how I honor Shiva and Shakti by removing all separation and becoming one with them. Out of Supreme love they swallow up each other But separate again for the joy of being two. They are not completely the same but neither are they different. No one can tell exactly what they are. How intense is their longing to be with each other. This is their greatest bliss. Never, not even in jest, Do they allow their unity to be disturbed. They are so averse to separation That even though they have become this entire world, Never for a moment do they let a difference come between them. They created a difference to enjoy this world. When that "difference" had one glimpse of their intimacy It could not help but merge back into the bliss of their eternal union. They become two for the sake of a divine play, But in every moment they seek to become one again. How can we distinguish these two from each other? He appears because of Her, And She exists because of Him. To capture light we take hold of fire. To capture the Supreme Shiva we must take hold of Shakti. An object has a reflection: When looking we see two images, yet there is only one thing. Likewise, this world is a reflection of the Supreme Lord. We may see two, Yet only One exists. Out of pure emptiness She gives rise to the entire world. Everything depends on Her. Yet She exists only because of Her Lord. Merged in unity there was nothing to do. So Shakti, the bringer of good fortune, Created this world for the sake of divine play. She reveals Her Lord's splendor by melting Herself and becoming everything; And He glorifies Her by hiding Himself completely. He is so mysterious and subtle, That while apparent He cannot be seen. It is by Her grace alone that He comes into being. While He is sleeping, She gives birth to all that exists and all that does not exist. When She is sleeping, He has no form at all. Look! He is hidden, and cannot be found without Her. For they are mirrors, each revealing the other. She is His very form, But Her radiance comes from Him. Blending into one, they enjoy the nectar of their own union. Shiva and Shakti cannot be separated. They are like musk and its fragrance, like fire and its heat. In the light of the Sun there is no difference between day and night. In the Light of the Supreme Truth there is no difference between Shiva and Shakti. Jnanadeva says, I honor the union of Shiva and Shakti, who devour this world of name and form like a sweet dish. All that remains is the One." Embracing each other they merge into One, As darkness merges with the light At the breaking of dawn. When we discover their Unity, All words and all thoughts dissolve into silence, Just as when the Universal Deluge comes, the waters of the ocean, and those of the Ganges, will merge into one. The air and the wind will merge into the endless sky; The sun and its light will merge into the Universal Fire. With a true vision of them, the seer and the seen merge into one. Again I honor the two who are one. They are like an ocean of knowledge. And only those who throw themselves in can drink of their waters. I appear separate from them just so I can honor them. But that separation is not real, it is only in name.